A new deck can cost as much as $40,000, while a new patio with Nicolock pavers is a much cheaper investment and still adds value to your Severn home. Potential homebuyers want a house with a lot of upgrades and minimal projects, so adding a patio through Nicolock pavers can add a ton value to your home. Everyone wants to sit out on a patio with a cool drink during the summer, so if your home doesn’t have a patio, buyers in Severn may just pass over your home completely when it’s on the market. Rich and vibrant colors that don’t fade over time. Durability. 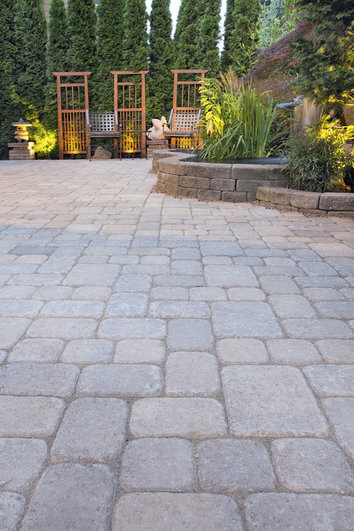 Nicolock pavers can withstand de-icing salts. Winters in Severn can bring a lot of ice, so it’s good to know that you can use de-icing salts and still have your patio look pristine. Nicolock pavers offer a lifetime warranty. If you aren’t ready to sell your home in the foreseeable future, you can still find ways to add value and protect the value of your home. According to Remodeling Magazine’s annual Cost vs. Value report, a new patio can offer a return on investment of up to 80%. Since Nickolock pavers are so durable, this is an investment that will hold up until your ready to sell. When your patio is constructed through Nickolock pavers, you are supporting a company that is 100% U.S. owned and operated. Not only will you receive a beautiful patio with this type of paver, but you are also supporting the economy. If you’re ready to add value to your Severn home, then Freedom Fence and Home wants to work with you to turn your vision into a reality. With 40 years in the home improvement industry, Freedom Fence and Home has earned a reputation for high quality work and even higher quality customer service at an affordable rate. Our hardscape experts are here to help homeowners and homeowners and business owners in Severn and the surrounding area design a patio that will add aesthetic appeal, functionality, and value to their home for years to come. Click Here to view our patio gallery. This entry was posted on Thursday, September 3rd, 2015	at 4:48 pm	. Both comments and pings are currently closed.